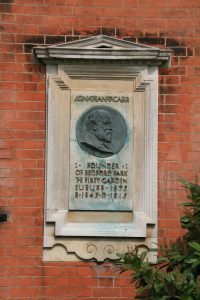 Long considered a prototype for later garden cities and suburbs, Bedford Park in west London is the creation of Jonathan Thomas Carr (1845-1915), a cloth merchant with liberal leanings, family connections in the world of art and a taste for property speculation, which was not always successful. He was the subject of a record 342 bankruptcy petitions. Inspired by the Aesthetic Movement of the 1870s, Carr created an ideal suburb for the artistically inclined middle classes who could no longer afford Chelsea. Carr’s opportunity to put these ideas into practice came in 1873 when he married Agnes, daughter of Hamilton Fulton, a civil engineer who lived in Bedford House and owned 24 acres of surrounding land. It seems likely that Fulton, too, saw the potential for development, with good transport links to all parts of London already in place. Thanks to nearby Turnham Green Station the City was a mere 30 minutes away. In 1875 Carr bought Fulton’s 24 acres and set about planning a new kind of estate in which aesthetically acceptable houses at cheap rents would be set in an informal layout that preserved as many mature trees as possible. 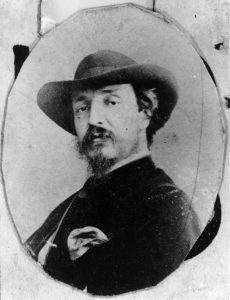 His first architect was Edward William Godwin (1833-86) who had designed houses for Oscar Wilde and James McNeil Whistler in Chelsea. As well as being prominent in the Aesthetic Movement, Godwin had also designed cheaper houses elsewhere, which appealed to Carr’s need for economy. Carr commissioned designs from Godwin and the firm of Coe and Robinson. The former provided designs for two houses, one detached and one semi detached, while the latter drew up one semi-detached design. As was to be his way with all his architects, Carr bought the designs outright, and retained control over where and how they were built with limited further input from the original creator. However, when these first house designs were published in the architectural press they attracted severe criticism for perceived defects in their internal planning. 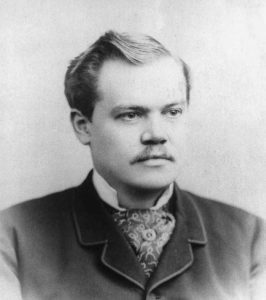 Carr was not going to live with adverse publicity, which he could ill afford so early in his enterprise. 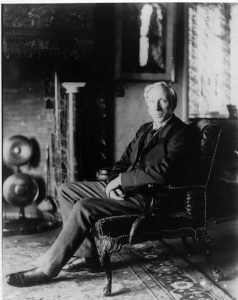 He therefore parted company with Godwin and Coe and Robinson and had his surveyor/architect William Wilson adapt Godwin’s detached design. He then turned to another leading architect of the time, Richard Norman Shaw (1831-1912). Shaw’s first designs for Bedford Park, produced in 1877, were built next to Godwin’s houses at the bottom of The Avenue. Carr was so delighted with them (and with the reception they received in the press), he commissioned a further range of different designs. It was these, which established the architectural character of Bedford Park that we recognise today, and which were so influential by their sheer novelty. Shaw presented a drawing by Maurice B Adams (1849-1933) of imaginary streetscapes featuring his different designs, with the boundary fences, piers and other peripheral features that are now so familiar to us. The images he produced then are a remarkably accurate prediction of what was eventually built. Shaw designed the Church of St Michael and All Angels, along with Tower House, the magnificent home of Jonathan T Carr, now replaced by St Catherine’s Court, a 1930s block of flats. During this phase of the development Wilson is credited with a number of detached cottages, while Adams (1849-1933) designed the extension to St Michael’s church and parish hall. Despite setting the style of Bedford Park, Shaw had no role in planning the estate, in deciding which houses should be built where or, indeed, in the supervision of construction. Rather than the process, what was important was the result, which boils down to the elusive concept of character. The essential ingredients were the ad hoc nature of the planning, which successfully copied the organic growth of a village, the retention of mature trees, and the architecture itself, using materials that gave the place an established look in a short period of time. By the early 1880s the heart of Bedford Park was complete, but Carr had steadily acquired more land, and was still building. The development now entered a final and different phase, prompted by the resignation of Shaw as the estate architect, and the refinancing of the enterprise as a Limited Liability Company. It would also appear that at about this time William Wilson left the project. Shaw had wearied of Carr’s demands and, it is said, of his reluctance to settle his bills. However, he set up the succession of his pupil and protégé Edward John May (1853-1941), who was about to start in practice on his own. The architectural progression from Shaw to May is almost seamless: May worked on Shaw’s designs, and Shaw probably looked over his shoulder when he was operating independently, designing buildings such as the Club. The essential style did not change at all. The houses in Priory Gardens date from this handover period, and stylistically could be from the hand of either. Notwithstanding this, there is a distinct difference in the character of the streets developed in the 1880s. The changing emphasis of the development, now nominally the Bedford Park Company Ltd (but in reality still Carr), and perhaps a changing market, led to the laying out of bigger plots. On these were built larger houses and, most important of all, a higher proportion of individual houses for individual purchasers. The most striking example of this is in The Orchard, where most houses are one-offs, designed largely by May, on plots up to four times the size of those in Woodstock Road built a few years earlier. For this reason it is arguable that May had also taken over the responsibilities of siting and the overall planning of the project. Jonathan Carr’s greater scheme for Bedford Park, which by that time included a proposed westward extension to be designed by May, was brought to an abrupt end in 1886, owing to the failure of the company, which had been formed in 1881 to finance the project. An area comprising about half the land that had been acquired is shown on Adams’s map, drawn in 1931, which contains the original core of houses now listed. From 1887 until the start of World War I construction proceeded on the remainder of the land, now sold on to various other developers. Although they built similar houses, they did not use previous designs, so this turned out to be the end of Bedford Park’s distinctive design in both houses and layout. Under Carr’s control there had been a definite feel of unity in style and purpose, along with the growth of a fairly small community. Nevertheless there are some interesting later houses, notably 14 South Parade designed by Charles Francis Annesley Voysey (1857-1941) in 1891. Bedford Park’s buildings and community spirit were an inspiration and model for the creators of later garden suburbs and cities. It may have lacked their planned social structure, but Carr provided first the Club, with a stage for theatricals and a billiards room; a church with adjoining parish hall; stores and The Tabard Inn. In contrast, the founders of Hampstead built tea rooms as they disapproved of alcohol. Unusually for Victorian times, women were allowed to join in Club debates. Judging from contemporary accounts, there were also frequent fancy dress balls and ladies cycled around in bloomers – another shocking display of progressive thinking! Early residents tended to be B-list celebrities with A-list connections – George Bernard Shaw and G K Chesterton were frequent visitors. The suburb attracted painters and illustrators – quite a few houses had studios – writers, actors, poets (the Yeats family rented various houses over the years), general free-thinkers and even the odd Russian anarchist. Yet the small cottage-style houses and terraces were also home to more modest wage earners such as clerks and tailors.